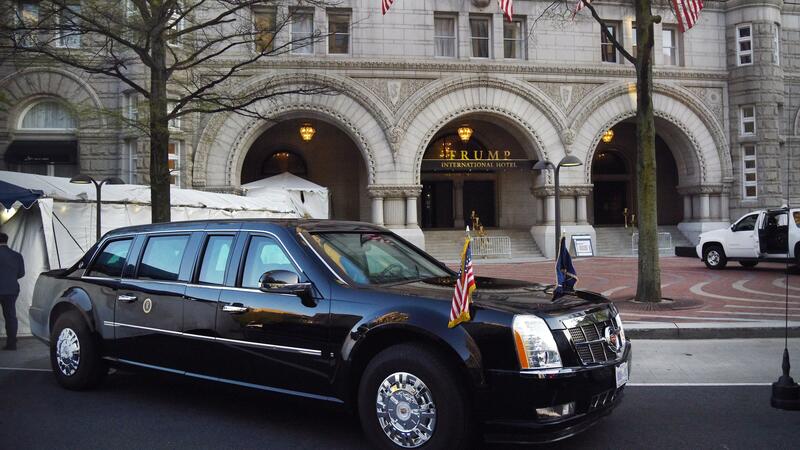 The presidential limousine, aka "The Beast," is parked in front of the Trump International Hotel as President Trump attends dinner with supporters on April 30 in Washington, D.C. In a case that could shed light on the finances of the secretive Trump Organization, a federal judge has signed orders to issue 30 subpoenas on behalf of the attorneys general of Maryland and the District of Columbia in their lawsuit alleging that President Trump is profiting from foreign and state governments' spending at the Trump International Hotel in downtown Washington, D.C.
Trump owns a stake in the hotel and profits from those sources would appear to violate the Constitution's bans on gifts from foreign and state governments — as D.C. Attorney General Karl Racine called them, "our nation's original anti-corruption laws." Subpoenas are directed to 13 entities attached to President Trump, ranging from several involved with the hotel; up to Trump's umbrella entity, the Trump Organization; and the revocable trust that his lawyers created to insulate him from issues like the emoluments lawsuit. Maryland Attorney General Brian Frosh told NPR those subpoenas are aimed at establishing "which foreign governments and which domestic governments are paying the Trump Post Office hotel, then where's it going, and how is the Trump hotel affecting the hospitality industry in D.C. and in Maryland." The lawsuit is based on an argument that the hotel, with a presidential boost, is taking business from other establishments. The Internal Revenue Service and four other federal agencies will also get subpoenas. Frosh said the IRS would likely have Trump Organization records showing "how much money they took in, how much money they spent, if they identified the sources of the income." He said Trump's tax returns are not included in the requests for information about Trump's business dealings. The documents sought in the subpoenas are one part of the evidence now being gathered. Federal District Judge Peter Messitte in Maryland set the evidence-gathering to end in August 2019 — coinciding with the Iowa State Fair, one of the first big events of the 2020 presidential campaign. A trial would follow. In other words, the Trump emoluments case could hit the headlines just as the president is revving up his re-election campaign. Donald Kettl, academic director of the University of Texas LBJ School Washington Center, said the timing has risks for the president. "If it turns out that now there are suggestions and maybe evidence presented there are people who at least took advantage of the Trump Hotel in Washington to try to curry favor, it's going to continue to stir a pot that the president would surely wish were left unstirred," he said. Kettl said the case, if it goes against Trump, could also bolster support for special counsel Robert Mueller's investigation into Russian interference in the 2016 election. And while it's unclear how many subpoenaed documents will become public, the plaintiffs' approach in this case could provide a road map for investigative journalists or oversight-minded House Democrats who will wield the majority in the new Congress beginning next year. The Emoluments Clauses of the Constitution have languished in legal obscurity for most of the past two centuries and have never before been tested in court in this way. Justice Department lawyers and private lawyers representing Trump have fought to derail the lawsuit, so far without success. They did block an earlier emoluments case. A third case, brought by some 200 congressional Democrats, is pending. The Justice Department says it will appeal the latest ruling in the Maryland-D.C. case to the 4th U.S. Circuit Court of Appeals.